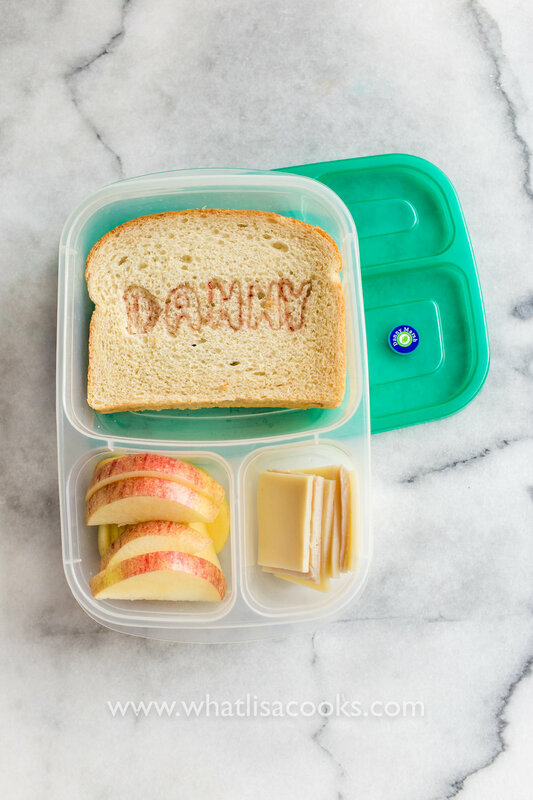 Five tips for easy school lunch packing! I get lots of questions about the products I use to pack our lunches, so I thought it might be helpful if I gathered up all my favorite items in one post. I think one of the most important aspects of easy lunch packing is to have products and containers that are consistent and reliable. While it is fun to have a nice variety of accessories, if you want to be quick and efficient in your lunch packing, choosing a reliable set of stuff that you can use day in and day out is going to be your best bet. Learn how to pack school lunch ahead - and save lots of time on school mornings! Are you trying to figure out where to start with shopping for school lunch packing? One of the questions I get fairly often is about my grocery lists. What staples I keep on hand, what I keep in my pantry, what do I buy for school lunches, etc. It is a topic that warrants several different blog posts, so for this one I am telling you about what is always on my grocery lists for packing school lunches. I've mentioned in my lunch posts before that I try to follow the basic food pyramid or "My Plate" guidelines for my lunches. That means in every lunch I try to have a protein, a fruit, a veggie, a grain, and usually some dairy. For my non meat eaters, the dairy is often also the protein. I don't always manage to get every category in there, but that is my goal. And I don't do it just because it makes a well balanced meal. Honestly I do it because following a simple formula actually makes it easier to pack a good lunch. You don't have to think about it quite as much - just grab one thing from each category and you're good. Once you have a simple formula to follow, lunch packing is even easier to accomplish if you have the right things to work with. The right tools + the right food. My favorite lunch box is the EasyLunchboxes. This is a simple and classic bento box style that makes lunch packing quick and easy. I have a whole post with all of my favorite lunch packing products here. My school lunch grocery list includes staples from each of the basic food group those categories. Each section below goes into detail about what is on my list and why, but if you just want to get straight to the basic list you can scroll all the way to the bottom and click to download a printable version. My printable list is also a great way to get your kids involved in figuring out what to pack - print out the list and give a copy to each child. Have them check off the things that they want in their lunch. My rule is that I want them to choose at least 3 from each category, that way I have some options to choose from when I pack their lunch. My basic advice for stocking your fridge and pantry for easy lunch packing is to just make sure you have a little bit of variety from each the food groups, and you'll be good to go. With a few different choices in each group, you can make limitless combinations and lunch will never get boring. Remember, I have four kids in school and a husband who often takes lunch, so I might keep more on hand than most. If you just want to get to the printable - scroll to the end. Bread for sandwiches: Some kind of whole wheat bread at a minimum. Plus a few other kinds of breads for variety - rolls or biscuits, English muffins, bagels, etc. Tortillas: These are great for quesadillas, burritos, wraps, pinwheels. Crackers: A variety of crackers for packing in the "lunchable" type of lunches. Snack crackers: little savory snack crackers are a great side. We usually have some form of goldfish, or Cheez-it, cheddar bunnies, little rice crackers, etc. Granola bars: My kids seem to get tired of any one kind of granola or cereal bar really fast, so I'm always looking for different choices. Sliced lunchmeat: At least turkey and ham, and occasionally I will buy roast beef, pastrami, or salami. Blocks of cheese: I always have at least one big block of cheddar cheese in my fridge. We slice it for sandwiches, cut in cubes for more of a snack box type lunch, and shred it for quesadillas, nachos, burritos. Packaged snack cheeses: cheese sticks, those round Babybel cheeses, we love the little cheddar Tillamoos from Tillamook, sometimes other shapes and sizes. Nut butters: Peanut butter, almond butter. If you do have a nut free school, then you can substitute SunButter (sunflower seed butter) in anything that you would otherwise use peanut butter for. My kids can't tell the difference. Yogurt: yogurt tubes, little cups of yogurt, or big cartons. I like to have a few flavors for easy packing, and I also always have plain yogurt. Plain yogurt is great with honey and berries, but it also makes a really great substitute for sour cream - you can give them tortilla chips and plain yogurt, and if you get a good strained greek yogurt then they are getting a decent amount of protein. I try to always have a little variety of fruit. Some of the year it's a lot of oranges and apples, depending on what's in season. If berries are in season, those are always on my list. Veggies are seriously hit and miss here, as I'm sure they are with most kids. But my kids are getting better and better about it - after many years of putting it in their lunch. Each of my kids has a different type of raw veggie that they will consistently eat, so I try to always have each of their favorites. Cookies - we go for the less sweet varieties for school: grahams, animal crackers, most of the little Annie's bunny snack cookies. Here is the printable list. You can click here or click on the image below. 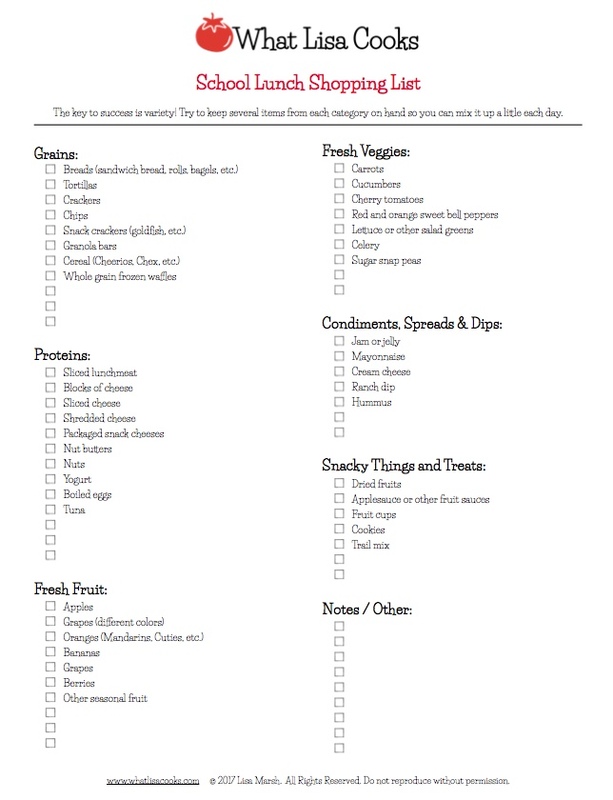 Use it as an inventory list, or a shopping list, or a menu - whatever works for you! I hope you find it helpful! Are you looking for ideas for healthy after school snacks? I've got all the ideas right here! Figuring out healthy snacks that kids will actually eat can sometimes seem like one of the toughest challenges. It should be simple, right? It's just a snack for goodness sake! But somehow it's not always that easy. They get bored, we get bored, we get in a rut that can be hard to get out of. To try to help you out, I've pulled together a list of my favorite snack ideas for kids (and for the whole family). I try to stay mostly healthy, but let's be honest, we're not all perfect and sometimes we just need to get something in them! We eat our fair share of goldfish crackers and chips around here too - it's not all veggies! It's a lot easier to stay with the healthy options if you've somewhat planned ahead and you've got what you need. Sometimes even when I am doing my meal planning and shopping lists I will try to jot down a few ideas for snacks for the week. A lot of the things I serve for snacks are the same things I pack in lunches - just in smaller quantities. So if you look at my lunches, especially my no-sandwich lunches, you'll get plenty of ideas. My first goal for snacking - especially after school - is to refuel their brains and bodies just enough to help them recover from their long school day, have enough energy to get through their homework or after school activity, but still be hungry again by dinner time. I don't know about all kids, but when my kids get home from school they are HUNGRY! My second goal for snacks is that it needs to be quick and easy. I make enough meals, I don't need to be spending a bunch of time prepping snacks. I want stuff that's quick for me to get out and put on a plate. Prepping ahead of time helps with this, like keeping veggies already cut, fruit washed, and snack containers filled and organized. It's even better if the snacks are stored in a way that the kids can help themselves - I try to keep snack sized cheese, yogurts, veggies, and fruit at a level where my kids can reach. I think snacks also need to be quick and easy for kids to eat. They want to get on with the fun. So foods that are bite sized and not too messy are ideal. I like to keep the same ideas in mind for snacks as I do for all other meals - a balance of protein, fruit, veggies, and carbs. Not all at the same time, but I just try to keep some balance in mind with the snacks I offer through the course of the week. I try hard to minimize the amount of pre-packaged snacks we have at home. Not because I have anything against them, there are plenty of healthy options, but mostly because that stuff gets expensive! My four kids can demolish a box of granola bars or applesauce pouches in minutes. I keep a good supply of those kinds of things available in our garage to throw in a snack bag for when we are out, but at home I aim as much as possible to not have packaged snacks. And, as you can see from some of the pictures, when I have the time I prefer to pack snacks to go as well. We've got lots of little containers and boxes that are great sizes for snacks on the go. One of my favorite things to do for snack time, and sometimes even lunch when we are home, is to just put out a platter or cutting board with a variety of choices. It's easy for me, and I've found that my kids will actually eat better if they have a little control over the choices. For lunch I will tell them they have to choose a veggie and a protein, for snack time I will just let them have whatever they want off the plate. Berries, my kids go nuts for any kind of berries. Avocados - my girls like to fill the center with soy sauce and scoop them with a spoon, or we love avocado spread on toast or bagels. For some reason my kids are much more willing to eat raw veggies than cooked. Fine by me. It's easier. I try to keep a variety in the fridge so I can serve a selection that will include something for everyone. These are great because they keep longer, and more and more stores are offering a wider variety of dried things. Any freeze dried fruits - these are crunchy, instead of chewy like normal dried fruits. You can get all kinds - apples, bananas, strawberries, mango, etc. I usually get them at Trader Joe's, but I've seen a wide variety at Whole Foods, and sometimes at Costco. Apple sauce, or any other kind of fruit sauce. Snack sized cheeses. For snacking it works best to either have pre-packaged cheeses like Babybel or string cheese, or just take a few minutes once a week to cut a big block of cheese into cubes or sticks. Small cubes are great for smaller fingers. Milk. Yes, sometimes just milk. A cup of milk has 8 grams of protein. It's a great way to quickly get a kid fueled up with some protein and natural sugars. I don't even mind a little chocolate milk for those occasions when they really need a quick boost of energy - I usually try to keep a handful of chocolate milk boxes in my car, in case someone is especially hangry at school pickup. Nut butters - great on celery or crackers, or I have one that will just eat a spoonful. Mini hot dogs, or a regular dog cut into bites. Tuna salad with crackers. I like to mix in shredded cheese when I make tuna for the kids. 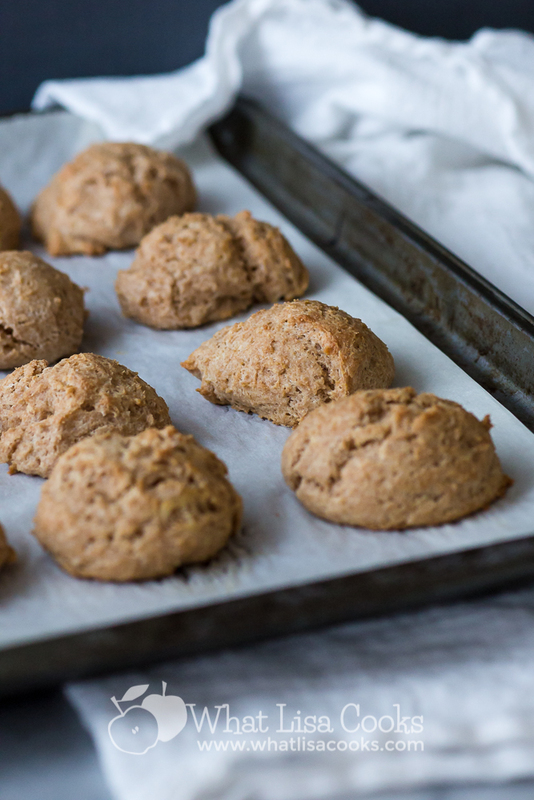 Homemade baked goods are perhaps the ultimate in after school snacking. They will create fond memories that last forever. Muffins: you can pack a lot of goodness into homemade muffins. I make extra and keep them in the freezer. Mini muffins are great for snacking. Quick breads - banana bread, zucchini bread, pumpkin bread. Whole grain bread & rolls. A little butter or jam on a nice multi-grain roll or slice of bread is a great snack! 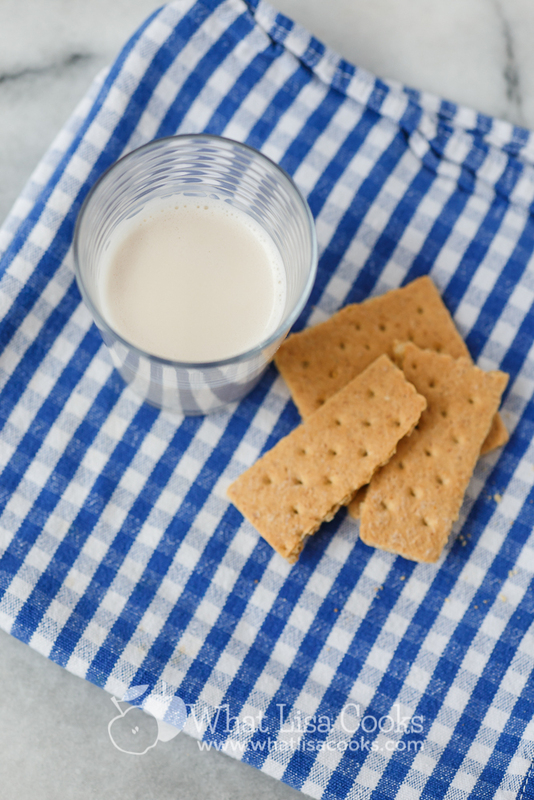 I have a recipe here for a super quick biscuit that my kids just love. A slice of a really good quality multi-grain bread has 4-5 grams of protein. Cookies. In moderation of course, but you can actually cut back the sugar quite a bit in a lot of cookie recipes, or swap it for honey, and you have something much healthier. Pizza rolls (here's how I do them), or any other kind of savory baked item. Lots of different kinds of regular crackers - you know, Ritz, Triscuits, etc. Of course we also do the usual kid favorites - cheese crackers, animal crackers. Packaged lower sugar cookies - little mini graham cookies, animal crackers, etc. Some kids love dipping, so dips can be a great snack with veggies, crackers, or bread. Bean dip - I like to just do refried beans heated with some shredded cheese. You can add a little salsa if your kids like a little spice. Guacamole - sometimes I buy the little single serving containers, or it can be just as easy as mashing up an avocado with a fork and adding a bit of salt and lemon juice. Smoothies & milkshakes. Really the possibilities are endless. These are great for busy on-the-go type of days. Sometimes I will make a really loaded smoothie and take them in the car for pickup, if we are running around to activities. Simple sandwiches. If you have a few kids, you can make one simple sandwich, like a toasted cheese or a PB&J, and cut it in quarters. A quarter of a sandwich with a few sliced apples is a nice little snack. You don't have serve the "typical" snack foods just because it's snack time. Anything they like to eat, and you are ok with them eating, makes for a fine snack. Just serve it in a snack sized portion, rather than a full meal portion.